Training began immediately; then came showing and we caught show bug fever. 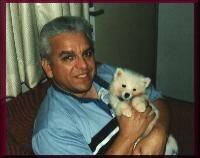 We had to have a male Eskie, and Jaybar had the right one, so we drove to Illinois, and Prince came to live in our home, too. 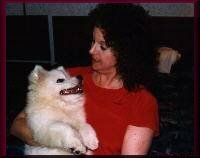 Then, at the Spring National that year, we met Anna and Morey of Eros American Eskimos, and fell in love with their dogs. Now we had to have one of their puppies, so later that fall Cissy came to live with us, too. When you are in love with Eskies and they love you, it's impossible to resist the opportunity to aquire a truly outstanding pup, so while on a trip to the next Spring national, we stopped at Jaybar to add Chava to our family. We actively exhibit our Eskies as we are unconditionally loved by them all. We thank God for creating such beautiful and loving companions for us. So, here we are. We would love to hear from you. We'll see you around the show ring. Please stop by and say hello. 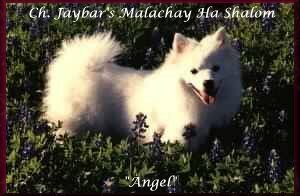 Take a minute and meet our Eskie Family on "Our Eskies" page.